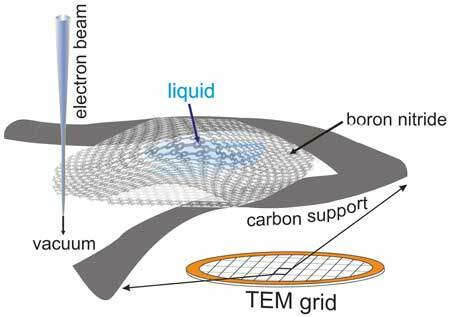 (Nanowerk News) A new microscopy technique developed at the University of Illinois at Chicago allows researchers to visualize liquids at the nanoscale level -- about 10 times more resolution than with traditional transmission electron microscopy -- for the first time. The new technique can be used to follow nanoscale-sized tracers used in biological research, and to visualize processes at liquid-solid interfaces at unprecedented resolution. Using their specialized sample holder, or boron nitride liquid cell, the researchers describe unique properties of water and heavy water at the nanoscale level. They report their findings in the journal Advanced Materials ("Vibrational Spectroscopy of Water with High Spatial Resolution").